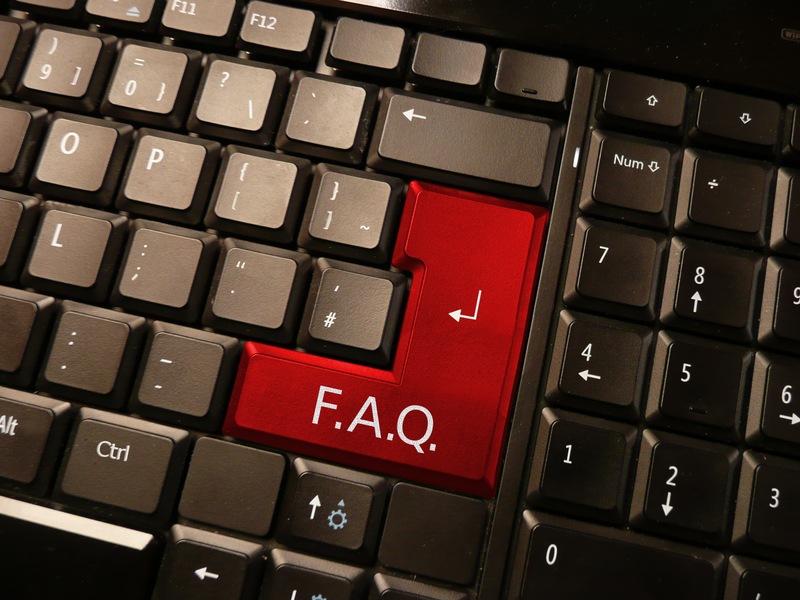 This post is a combination of answers to frequently asked questions (FAQs) and a tour of the OARS website. The purpose is to show you where to find the information you need to learn about funding opportunities, prepare proposals, and build your grantsmanship skills. Who do I contact if I need to talk to an actual person? We’re starting with this question because while we want you to be able to use our website to find the information you need, but we don’t want you to spend an inordinate time trying to chase something down. Especially if someone in our office can answer your question off the top of their head! Your first point of contact will probably be your OARS consultant — either Anne Schauer or Tricia Callahan. They can either answer your question directly, or get you connected to someone else in our office who can. 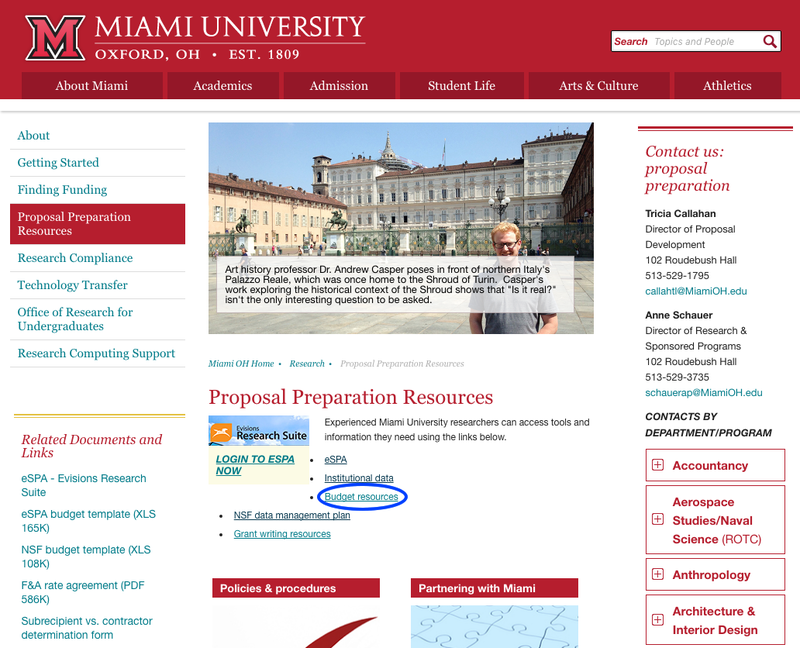 Click on the Proposal Preparation Resources link in the lefthand navigation on the OARS homepage (MiamiOH.edu/research). 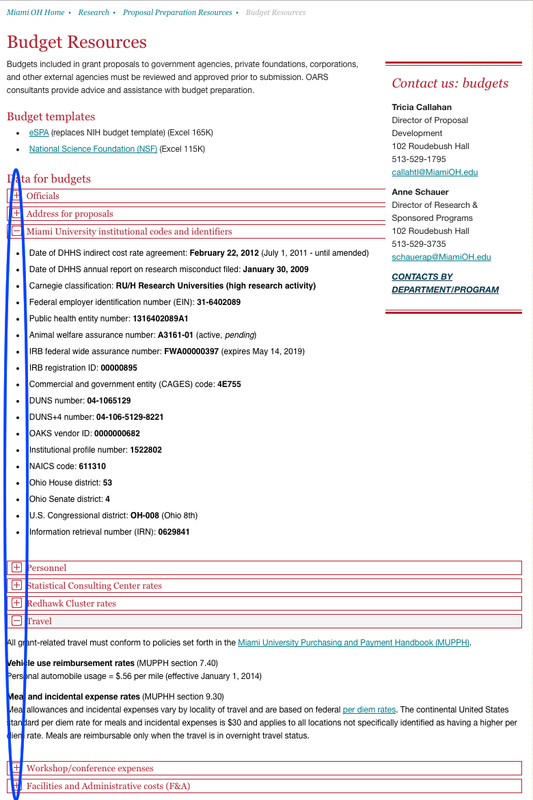 Scroll down the list of departments and centers/institutes in the righthand column and click the + next to the one you’re affiliated. The item will expand to display the consultant assigned to that department or center/institute. Feel free to contact Anne or Tricia at any time. 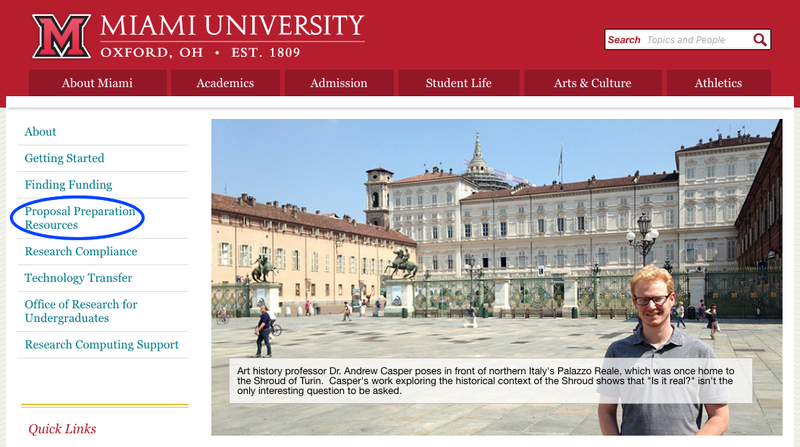 Anne can be reached at 513-529-3735 or schauerap@MiamiOH.edu. 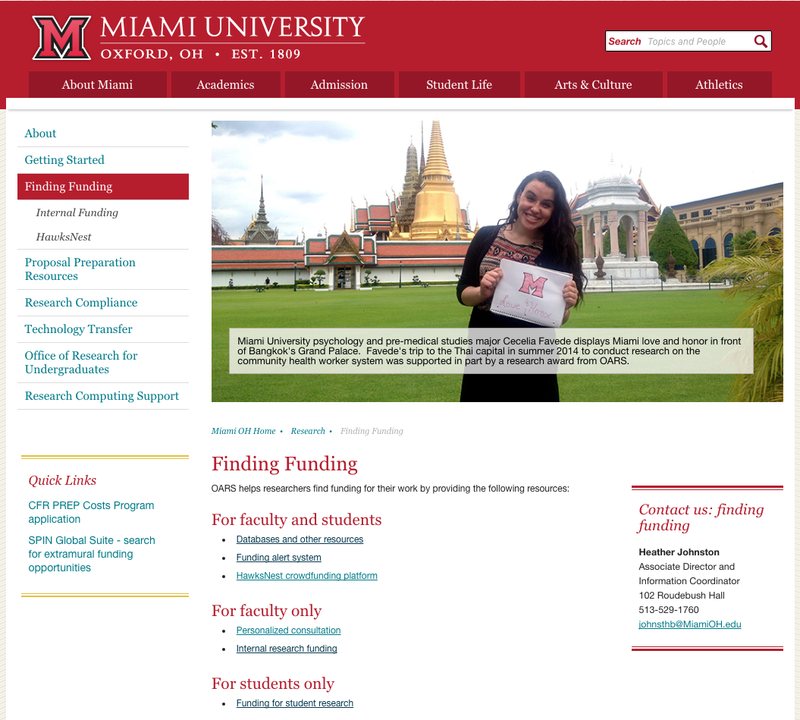 Tricia can be reached at 513-529-1795 or callahtl@MiamiOH.edu. Both are located in 102 Roudebush Hall. 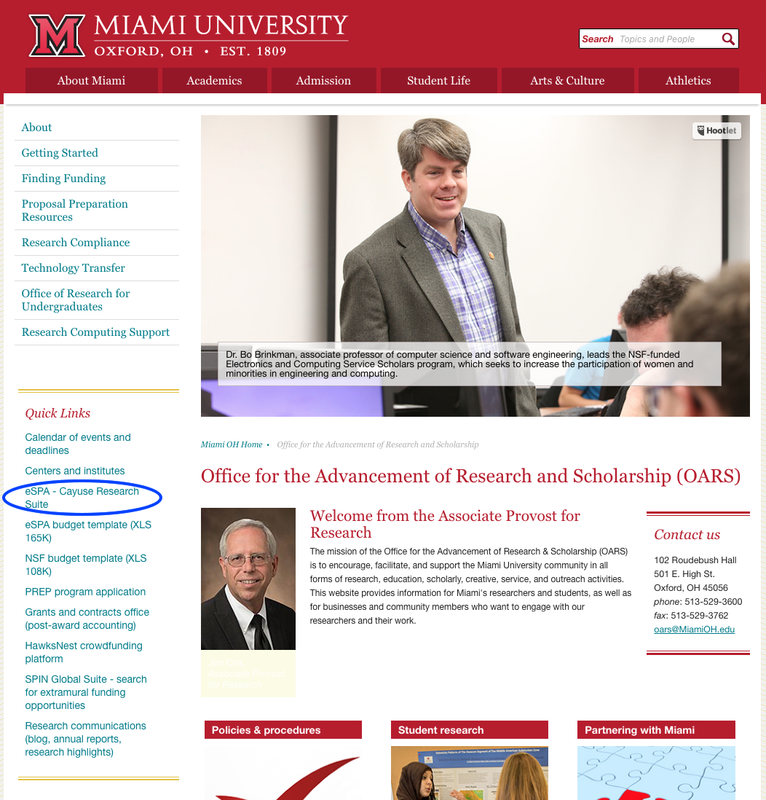 How do I find out about OARS events? Scroll down until you can see the “News and events” widget in the lefthand column. 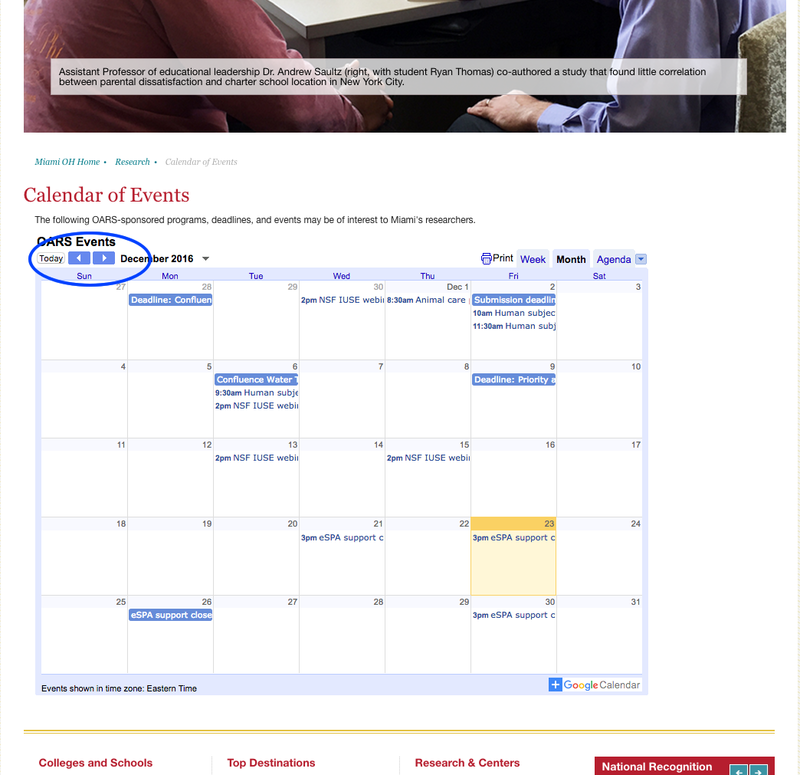 Click on the + next to “Calendar of events and deadlines” to expand that option, then click on the word here in the text. Use the arrows at the top of the calendar to scroll between months in the calendar. In addition to OARS events, the calendar also includes research-oriented events sponsored by other Miami departments or by outside parties. Finally, the calendar also includes application and submission deadlines for internal and external competitions and submission opportunities. 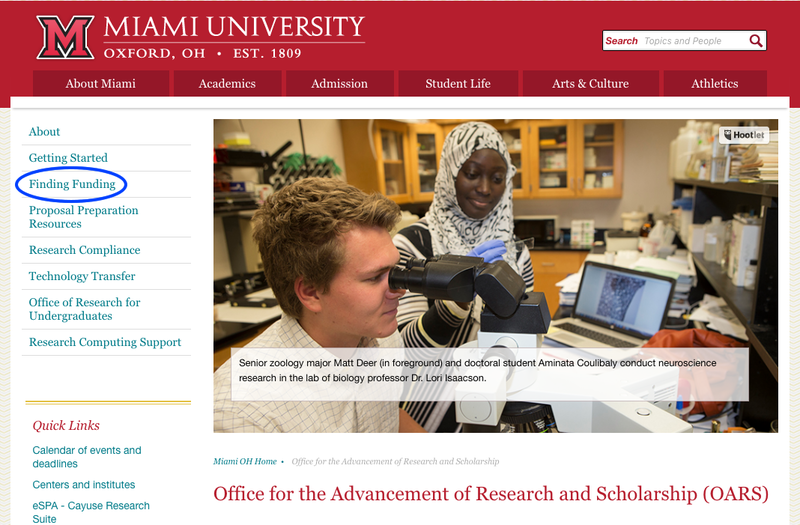 How do I get started if I am a new researcher or an experienced researcher who is new to Miami? Click on Getting Started in the lefthand navigation on the OARS homepage. 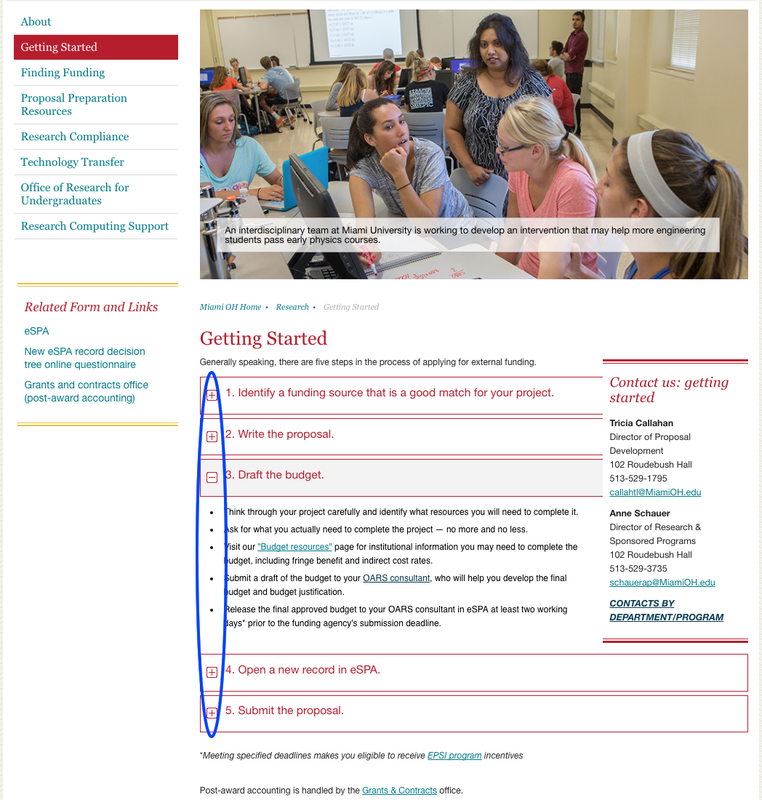 From there, you can click on the arrows to expand information about each step in the process of seeking external funding. Where can I find information about funding opportunities? 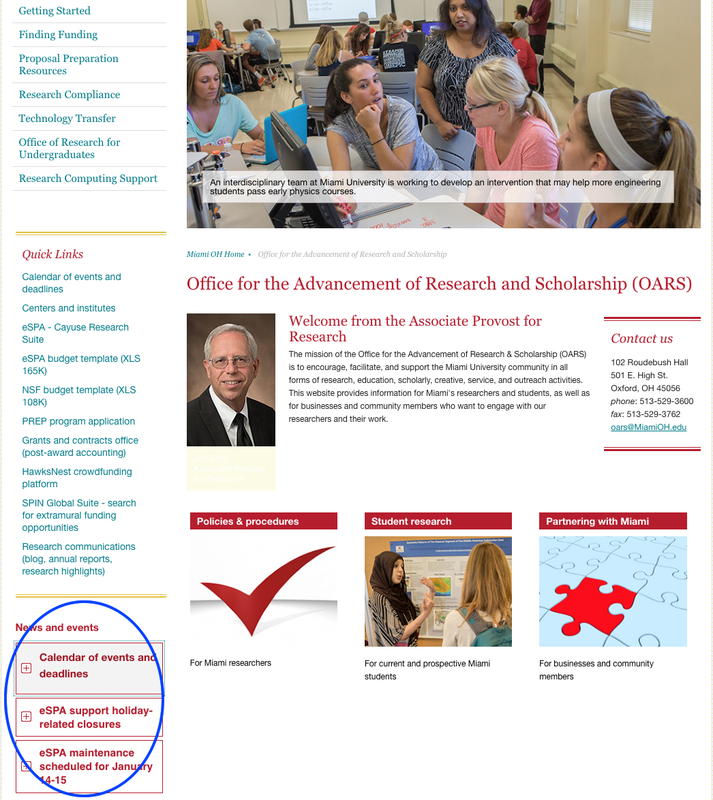 Click on Finding Funding in the lefthand navigation of the OARS homepage. You will then see additional links to resources for finding funding to support your research or other project. 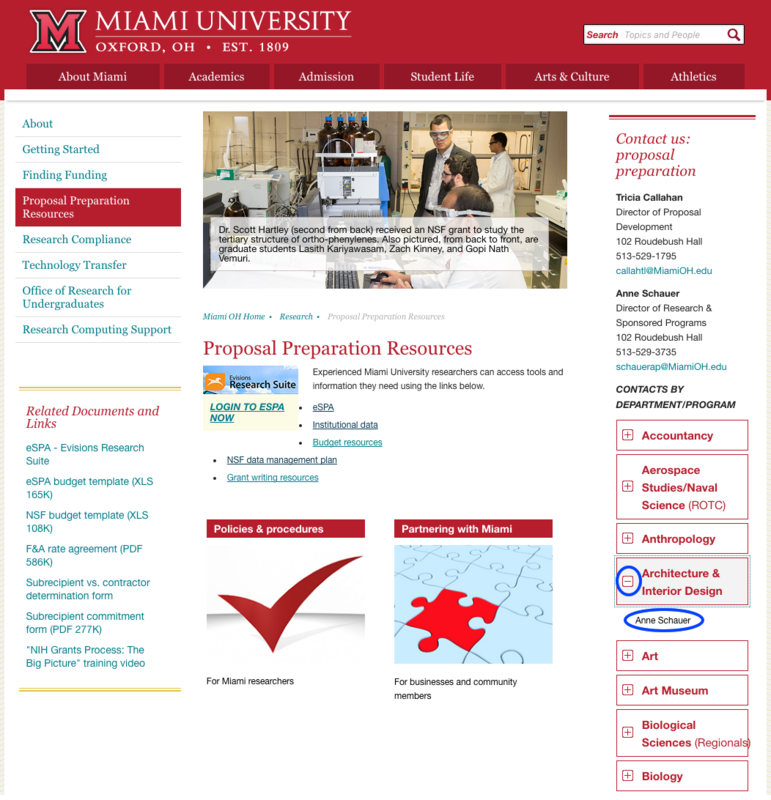 Where do I find Miami’s DUNS, EIN, and other institutional information that needs to be included in my application? Click on the budget resources link in the center of the page. Click on the arrows to expand the various categories of information. How do I get approval of a proposal from my chair and dean and from OARS? 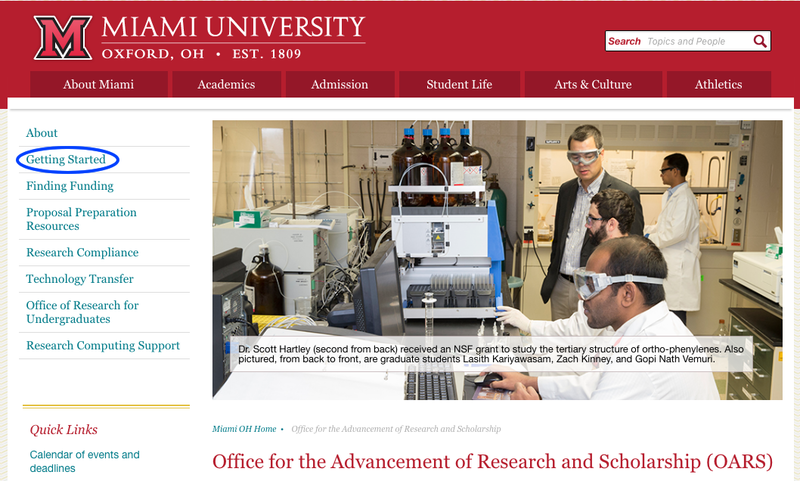 Miami University began uses an electronic sponsored programs administration (eSPA) system to help manage research administration and electronic submission of proposals. Specifically, Miami has implemented two programs within the Evisions Research Suite: Cayuse 424, which is a Federal proposal development and system-to-system platform, and Cayuse SP, which reduces the need for paperwork and transforms proposal routing into an electronic process. 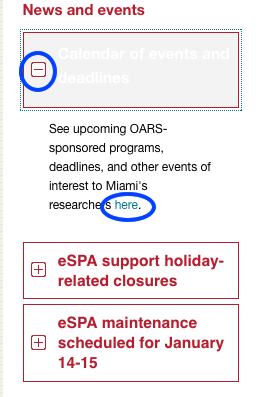 You can access Miami’s eSPA system by clicking on the Quick Link on the Miami homepage. If you need help with eSPA, contact your OARS consultant. Internet photo by Rock1997 via Wikimedia Commons .FAQ photo by photosteve101 via Flickr. Both used under Creative Commons license. This entry was posted in Finding funding, Grants administration, OARS news and events and tagged administration, budgets, eSPA, events, extramural funding, funding opportunities, proposal submission, training. Bookmark the permalink.